CHIANG MAI, Thailand — Ethnic studies researchers have urged the government to adopt an education policy that incorporates the mother tongue based-multilingual education (MTB-MLE) approach. In 2012-2013, the government of then President U Thein Sein approved the use of ethnic languages in schools, but the textbooks used are merely translations of the existing Burmese-language curriculum into the respective ethnic languages. 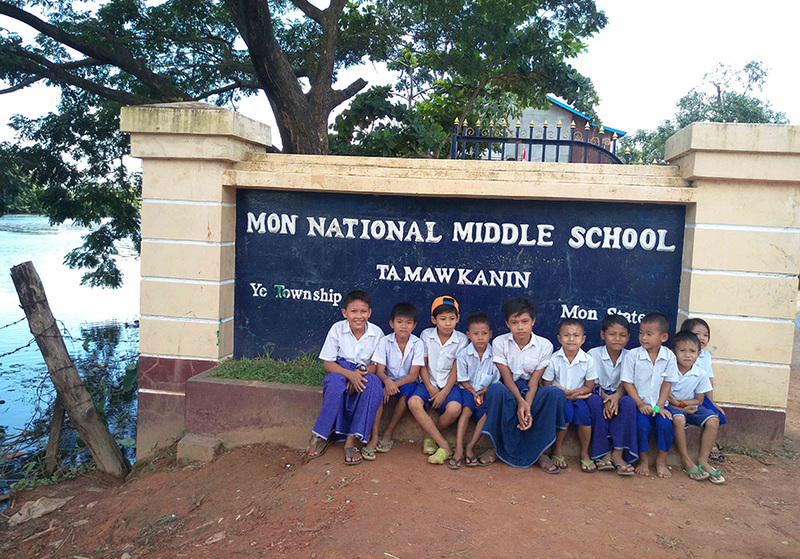 The argument for adopting an MTB-MLE approach in educating Myanmar’s ethnically diverse students has steadily gained momentum. “Government educators have always said it is hard to implement the MTB-MLE approach, as Myanmar has 135 ethnicities. The state government officials we interviewed are not opposed to this teaching method, but expressed concern that implementation would be too complicated for them to handle. We want to show everyone that we can implement such an MTB-MLE system, as has been done at Mon national schools,” said Dr. Pon Nya Mon, a deputy executive director of the Ethnic Nationalities Affairs Center (ENAC). He was referring to the results of a new study by ENAC released last week. In August 2017, ENAC conducted a study at Mon national schools that have been using Mon-language curricula for more than four decades. It documented in detail how the Mon schools operate and shared case studies from schools in India, Switzerland, Papua New Guinea and the U.S.
ENAC plans to submit its findings to the upcoming third session of the 21st-Century Panglong Union Peace Conference and ask the delegates to incorporate the MTB-MLE system into their social sector policies. “We hope the delegates to the 21st-Century Panglong will discuss MTB-MLE and take it into consideration when making decisions about the social sector, which includes education. As education policy is not as controversial as security, we don’t think it will be hard to pass,” said Zo Tum Hmung, the executive director of ENAC. Moreover, the central government should allow state governments to manage their education budgets, he said. Mon national schools have been operating under the Mon National Education Committee of the New Mon State Party (NMSP) since 1972. Some schools were integrated into the public school curriculum after the NMSP signed a ceasefire with the military government in 1995. Mon schools currently use an integrated curriculum. More than 130 Mon National Schools focus mainly on Mon language (100 percent) at the primary level, and then reduce this to 60 percent in the middle school (early secondary) curriculum and 20 percent for high school (Grades 9-10). From the secondary level the curriculum integrates Mon and Bamar, the official language, to prepare the students to take the government’s matriculation exam in Grade 10. At mixed-language schools, Mon literature is taught. There are 92 schools currently using this system. However, at government schools, Mon, like all ethnic language classes, is taught only outside of the schools’ official hours. Ethnic language teachers have raised concerns about the difficulty of teaching translated textbooks, which they say do not reflect the respective minority ethnic groups’ cultures. The researchers insisted that there are many bilingual teachers who can speak both Bamar and their own languages, be it Mon, Karen, Kayah or other languages. The Mon curriculum was prepared for government schools in 2016. Other minority-language curricula are in the drafting process, though they are not yet integrated as Mon has been.